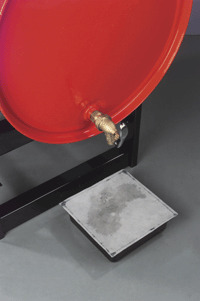 Catch non-aggressive drips of fluid with a Drip Pan - a polyethylene pan filled with sorbent polypropylene. Covered with rip-resistant, polypropylene - so the mess stays contained inside. Each Drip Pan sorbs up to 3/4 gallon.